Midlayers are key to a successful and pleasurable adventure or trekking endeavor. Oftentimes, however, I'm struggling to figure out the best match of layers for the treks that I do. Take for instance my trip to Lakdah - Indian Himalayas. The weather there turns cold and hot rather quickly and adding or removing layers is the norm. A bit of work really if you think about it. Why can't I just find a layer that will work with both ends of the stick? 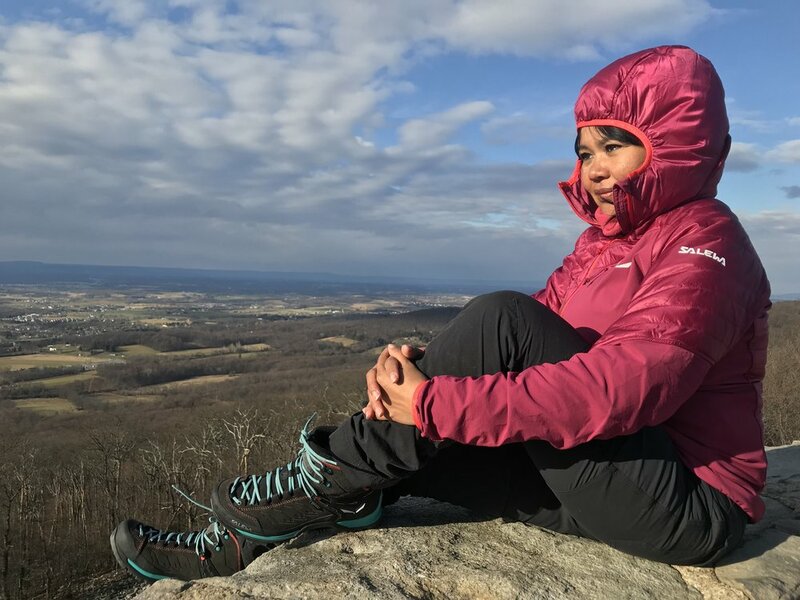 And, as an instructor on beginner's backpacking course in the Washington, DC area, I'm always in search of ways to improve the gear experience on the trails. Salewa Ortles 2 Hybrid Jacket comes into the picture. With its lightweight, I was easily impressed since the last thing I need as a global mountain nomad is a piece of gear that weighs heavily. Testing this gear in the winter time proved that it can handle cold weather well. In fact, I loved that it's warm and yet lightweight. My inner layers are more often than not on the heavy side and so I questioned the ability of this gear to keep me warm. After a few hours hiking on the Appalachian Trail on a cold 30 something degree day, I quickly realized this is going to be one of the most relevant piece of gear on my list. The pockets! I can always appreciate storage when it comes to my jackets. This one gives you 4 places to store your valuables and items for easy access. The lightweight material. This a plus and a must for a nomad lifestyle. The functionality of the jacket (giving warmth and high performance) is not at all compromised by the fact that this is a lightweight gear. Thanks to the hybrid and blend of the materials of this jacket - one can benefit from the lightweight feature without compromising functionality. The warmth factor. I tested this jacket on a hike in a cold windy day and it passes the test. Coupled with a baselayer or any other inner layer of choice, one can easily keep warm with the Primaloft feature of this jacket. The material did the job of keeping my core warm. The hood adds more toastiness to it - a feature I definitely love as it kept me shielded from the wind. Great fit & functionality. The elastic bindings on the cuffs and hem are great for hassle free movements on the trails. While hiking, you'll easily notice the jacket's elasticity as it allows for freedom of movement and versatility. And, while some down jackets aren't as flattering when it comes to fit, the Salewa Ortles keeps in mind the notion of "stylish." Shots on mountain tops and the trails will never be the same again with this gear. For great Instagram moments, you get the aesthetics with the comfort. Who wouldn't want that? This can easily turn into a favorite jacket for me. I can't wait to take it with me on my next global trekking adventure. Don't wait any longer - grab it and stay warm. (Financial compensation was not received for this post. A sample product was provided; however, opinions expressed here are my own).